For the pie: Unroll one pie crust into a 9 inch pie pan with a ½ inch wide lip. Set aside. In a large bowl, combine 2 eggs, both sugars, pumpkin pie spice, salt and pumpkin. Slowly stir in evaporated milk until fully incorporated. Pour pumpkin mixture into crust. Reserve. On a lightly floured surface, unroll second pie crust. Using a 1½-inch fall-themed cookie cutter, cut out 27 pieces. Beat remaining 1 egg in a small bowl. Brush egg onto the lip of the pie crust. Place cutouts on the lip of the crust. Brush tops of cutouts with remaining egg. Bake in the oven for 20 minutes. Using aluminum foil, cover decorated edges of pie to prevent over browning. Reduce temperature to 350º and bake for additional 45-50 minutes or until the center is set. For the topping: Pour cream into a medium bowl. Whip on medium speed, slowly add in sugar and pumpkin pie spice. Whip until stiff peaks form. Cover and refrigerate. 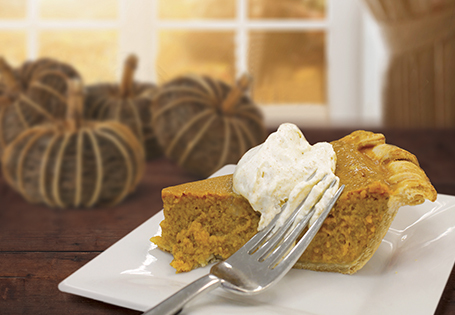 Enjoy with a large dollop on top of each slice of pie.